The curie (symbol Ci) is a non-SI unit of radioactivity originally defined in 1910. According to a notice in Nature at the time, it was named in honour of Pierre Curie, but was considered at least by some to be in honour of Marie Curie as well. It was originally defined as "the quantity or mass of radium emanation in equilibrium with one gram of radium (element)"  but is currently defined as 1 Ci = 7010370000000000000♠3.7×1010 decays per second after more accurate measurements of the activity of 226Ra (which has a specific activity of 7013366000000000000♠3.66×1010 Bq/g). The power in milliwatts emitted by one curie of radiation can be calculated by taking the number of MeV for the radiation times approximately 5.93. A radiotherapy machine may have roughly 1000 Ci of a radioisotope such as caesium-137 or cobalt-60. This quantity of radioactivity can produce serious health effects with only a few minutes of close-range, unshielded exposure. Ingesting even a millicurie is usually fatal (unless it is a very short-lived isotope). 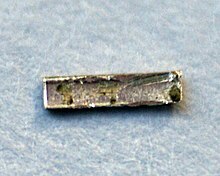 For example, the LD-50 for ingested polonium-210 is 240 μCi, about 53.5 nanograms. The typical human body contains roughly 0.1 μCi (14 mg) of naturally occurring potassium-40. A human body containing 16 kg of carbon (see Composition of the human body) would also have about 24 nanograms or 0.1 μCi of carbon-14. Together, these would result in a total of approximately 0.2 μCi or 7400 decays per second inside the person's body (mostly from beta decay but some from gamma decay). where λ is the decay constant in s−1. ^ a b Rutherford, Ernest (6 October 1910). "Radium Standards and Nomenclature". Nature. 84 (2136): 430–431. Bibcode:1910Natur..84..430R. doi:10.1038/084430a0. ^ a b Frame, Paul (1996). "How the Curie Came to Be". Health Physics Society newsletter. Retrieved 3 July 2015. ^ Delacroix, D (2002). Radionuclide and Radiation Protection Data Handbook 2002. Radiation Protection Dosimetry, Vol. 98 No 1: Nuclear Technology Publishing. p. 147. ^ "SI units for ionizing radiation: becquerel". Resolutions of the 15th CGPM (Resolution 8). 1975. Retrieved 3 July 2015. ^ "Nist Special Publication 811, paragraph 5.2". NIST. Retrieved 22 March 2016.